Post: Gaurav Akrani. Date: 7/28/2010. Comments (5). Label: Management. Decentralisation of authority is another concept closely related to centralisation. The delegation of authority by an individual manager is closely related to organization’s Decentralisation of authority. Decentralisation of authority means conscious/systematic effort to bring dispersal (spreading) of decision making power to the lower levels of the Organisation. In decentralisation, only broad powers will be reserved at the top level. Such powers include power to plan, organise, direct and control and maximum powers will delegated to the authority at the lower level. Decentralisation is just opposite to centralisation. Under centralisation, authority is mostly concentrated at the top level management. Centralisation and decentralisation are mutually dependent. In a large Organisation, the process of centralisation and decentralisation co-exist and reinforce each other. Decentralisation is a natural development when the Organisation grows large and complex. Here, centralisation of management is neither possible nor desirable. The only practical solution is to divide the Organisation into decision-making units and giving the powers to take routine types of decisions in regard to the functioning of those units. This is decentralisation in practice. In decentralisation, systematic efforts are being made to delegate to the lowest levels all authority except that which can only be exercised at the central points. Decentralisation is delegation not from one individual to another but delegation to all units in an Organisation. A company is said to be highly decentralized, when the delegation is company-wide in all functions and divisions of the company and also for a wide range of authorities and responsibilities. Decentralisation is different from centralisation as in centralisation, the decision making power is in the hands of one person only. We observe such centralisation in sole trading concerns. It is also noted that centralisation is one feature of traditional management in India while decentralisation is a normal practice under professional management. According to Henry Fayol, "Everything that goes to increase the importance of the subordinate’s role is decentralisation, everything that goes to reduce it is centralisation." 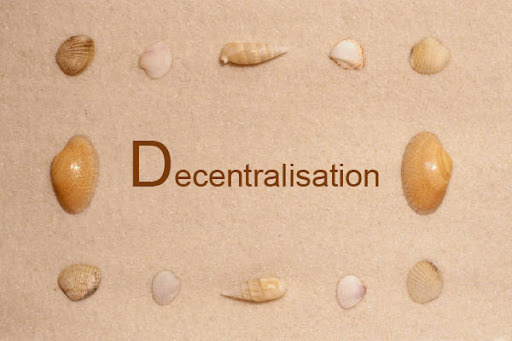 According to Louis Allen, "decentralisation refers to the systematic effort to delegate to the lowest levels all authority except that which can only be exercised at central point." This definition makes it clear that even in decentralisation, delegation to the lowest levels is not complete as the basic functions in the management process are centralized. Decentralisation helps to improve the quality of decisions/decision-making at the top level management : Decentralisation of authority among other executives at all levels in the Organisation relieves the top executive of the excessive burden saving his valuable time, which he can devote to more important and long-term problems. This is bound to improve the quality of his decisions regarding such problems. 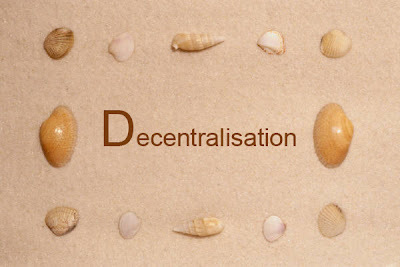 Decentralisation facilitates diversification of activities : It is a matter of common experience that an Organisation with departmentation on the basis of products facilitates diversification of products or market even when the authority is centralized. Decentralisation takes this process a step further. Managers of semi-autonomous product divisions are able to utilise their skills and experienced judgment. This has a bearing on their products and the market. The enterprise also attains maximum possible growth. Decentralisation is beneficial when new product lines or new activities are introduced in an Organisation. Such policy creates self sufficient units under overall co-ordination of top level management. Decentralisation encourages development of managerial personnel : Most companies find lack of managerial talent as a limiting factor in their growth. A company cannot expand effectively beyond the scope and abilities of its managerial personnel. Capable managers, however, can be developed only by giving managerial jobs to suitable persons and delegating them the authority to make important decisions. Such wide exposure gives them opportunity to grow and to have self development for higher positions. The more talented and capable persons will learn and improve and qualify themselves for higher managerial positions. Only a decentralized Organisation can offer such opportunities to future managers without involving additional expenditure. A decentralized Organisation also allows its managers adequate freedom to try new ideas, methods or techniques. In brief, decentralisation creates a team of competent managers at the disposal of the company. Decentralisation improves motivation : Research conducted by social scientists has proved that the Organisation structure itself exercises some influence on the motivation of the people working within it. An Organisation structure which facilitates delegation, communication and participation also provides greater motivation to its managers for higher productivity. Decentralized Organisation structure is most favorable for raising the morale and motivation of subordinates which is visible through better work performance. Decentralisation makes decision-making quicker and better : Since decisions do not have to be referred up through the hierarchy, quicker and better decisions at lower levels can be taken. Divisional heads are motivated to make such decisions that will create the maximum profit because they are held responsible for the effect of their decisions on profits. Thus decentralisation facilitates quick and result-oriented decisions by concerned persons. Decentralisation provides opportunity to learn by doing : Decentralisation provides a positive climate where there is freedom to make decisions, freedom to use judgment and freedom to act. It gives practical training to middle level managers and facilitates management development at the enterprise level. Decentralisation may lead to the problem of co-ordination at the level of an enterprise as the decision-making authority is not concentrated. Decentralisation may lead to inconsistencies (i.e. absence of uniformity) at the Organisation level. For example, uniform policies or procedures may not be followed for the same type of work in different divisions. Decentralisation is costly as it raises administrative expenses on account of requirement of trained personnel to accept authority at lower levels. Even the services of such highly paid manpower may not be utilised fully, particularly in small organisations. Introduction of decentralisation may be difficult or may not be practicable in small concerns where product lines are not broad enough for the creation of autonomous units for administrative purposes. Decentralisation creates special problems particularly when the enterprise is facing number of uncertainties or emergency situations. The decision-making process gets delayed and even correct decisions as per the changing situations may not be possible. The advantages of decentralisation are more significant as compared to its limitations. The limitations suggest possible problems relating to decentralisation. Efforts should be made to solve these problems. It is certainly not desirable to have centralisation (in place of decentralisation) only because of certain limitations. However, to what extent the organisation should be decentralized is a delicate issue. Here, certain factors such as size of the organisation and the abilities of lower level managers need careful consideration. I can't believe there are no comments on this archive. It is excellent. I still haven't text through out who because there's who many thought provoking ideas. its an excellent text, I have experienced most of the advantages and limitations in my organisation. I get detailed information of each and every topic i searched....... it is excellent. I am very much surprised that i get systematic and exact ans of my query. the context in this publication has enriched my research as an undergraduate student at kyambogo university in Uganda.thanks a lot.